Ross & Cromarty Roots | Alexander & Dolina Mackenzie, Kenina & Alexander. 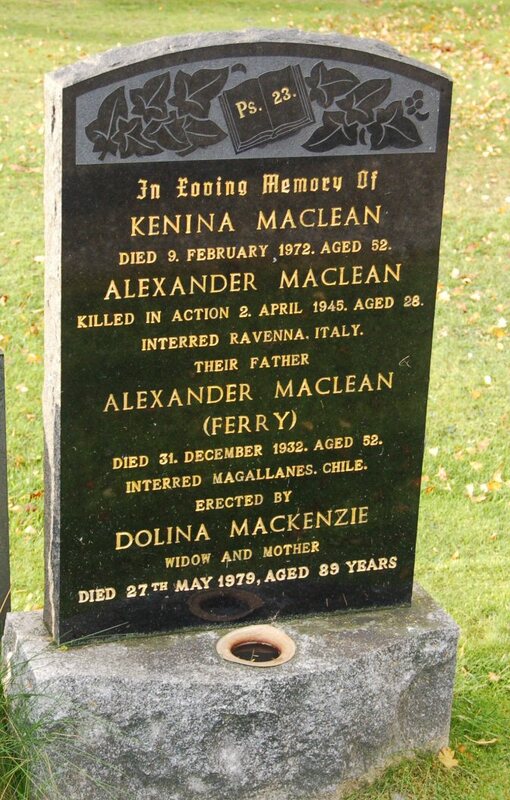 Alexander & Dolina Mackenzie, Kenina & Alexander. Ps. 23/In loving memory of/KENINA MACLEAN/died 9th February 1972 aged 52/ALEXANDER MACLEAN/killed in action 2 April 1945 aged 28/interred RAvena, Italy/their father/ALEXANDER MACLEAN/(Ferry)/died 31 December 1932 aged 52/interred Magdallenes, Chile. Erected by/DOLINA MACKENZIE/widow and mother/died 27th May 1979 aged 89 years. [Plan no. 313 - link to Plan below]. Picture Added on 12 February 2009.